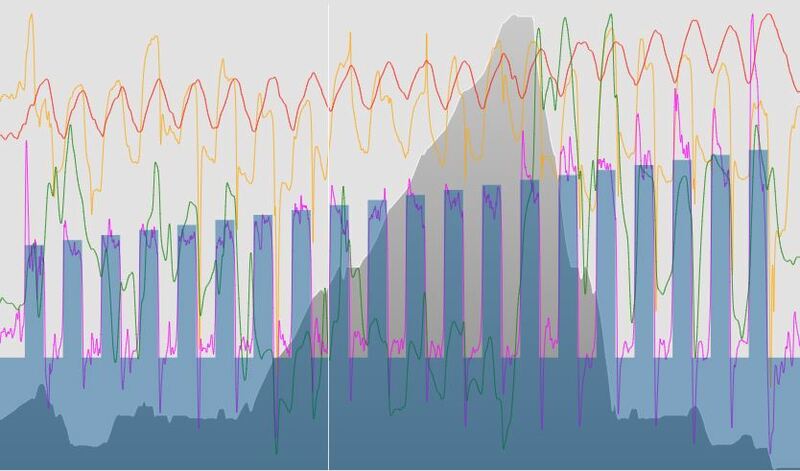 Since getting into triathlon training last year, I’ve encountered a whole slew of metrics, terminology and methods, most of which are pretty new to me. Particularly because I use Training Peaks as my primary workout recording tool and to interact with my coach, I’ve come to consider things on a daily basis that I never knew existed before. IF, TSS, FTP…there’s a seemingly unending list of acronyms to Google and to try to figure out the importance of. Ironically, one of the most challenging ones for me to master is proving to be RPE, or Rating of Perceived Exertion. In concept, it’s a very simple idea. You do a workout, and you record how it “felt.” In Training Peaks, it’s as simple as picking an emoji that corresponds to your feeling and picking a number on a scale of 1-10. I’ve also seen another scale that goes up to 20 or so, presumably for finer resolution of this subjective assessment. In practice, I find it very difficult to manage. There are so many things that go through my head when I try to describe how I “feel” — about anything, not just training. “How I feel” is a question that, for me, is usually almost impossible to clearly answer. My answer, or my attempt to formulate one, is usually comprised of what seems like a dozen or more different components, which I then have to distill down into a succinct answer. When I think about how a workout felt, it’s no different. I think about my physical feelings, my mental feelings, my emotional feelings, my expectations and how they align (or don’t) with reality, my general mood apart from the workout…just to name a few. On top of that, I have a hard time separating out “progress” on a micro-level. 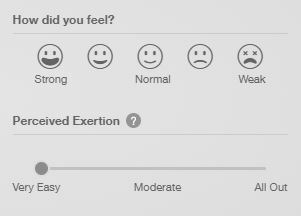 That is to say, if I feel badly at the start of a workout, but progress to feeling great by the end of it (whether physically or emotionally or mentally), how do I put a single number or emoji face on that? In some senses, it’s a success and feels great. In others, it might be lower than expectations and all I did was salvage a turd. I think this may be part of the reason why it’s tempting to lean in to objective metrics. They are hard numbers, without influence from subjective factors. If I average 200 watts, that’s what I averaged. There’s a simplicity there that is attractive amidst the mental chaos that can go along with focused training. On the other hand, metrics can be a vortex. You can become obsessed with numbers to the point that you disconnect from your subjective experience of training, lose the underlying connection to your body and its limits, and that sort of defeats the whole purpose of training for me. Ultimately, RPE is important for that reason. It forces you to think about yourself in connection with an experience you just had, and to evaluate that using nothing but your mind and body. I think that it will get easier with experience. In that respect, figuring out how to classify my “feeling” after a workout is a skill that I can practice. And like so many other aspects of triathlon training, it seems like that skill should translate to the rest of life, as well, where I often struggle to define complicated feelings.